Vembu BDR Suite provides agentless image level backup for the virtual machines. The VMs could run on VMware and Hyper-V.
Windows Server and Windows Workstation also can configured as image, file or application level backup. For Linux and MAC machines it is possible to configure file and application level backup. Support for backup and recovery of VMs running on Hyper-V Cluster setups. The scheduled backups will not be interrupted even when the VMs move from one node to another for High Availability. The modifications made on the VMs running on Hyper-V servers are by default tracked using CBT technology. When CBT fails, the checksum-based incremental tracking is leveraged ensuring seamless backups. Credentials of the VM hosts, guest VMs and physical computers can now be managed using the Credentials Manager, avoiding the need to enter the credentials every time. Any newly added disk to a VM on VMware/Hyper-V was backed up only on the next full backup. From v4.0, the new disk additions are designed to be detected and considered for back up on the next incremental schedule. If a VMware or Hyper-V VM backup job gets interrupted due to network failure, reconnection attempts will be made to continue the data transfer. Abort active replication jobs from within the Vembu OffsiteDR server console to terminate an ongoing replication from Vembu onsite to offsite server. 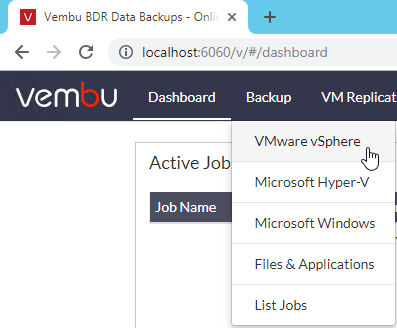 You can activate or deactivate Vembu BDR Servers from Vembu OffsiteDR if you wish to stop the backup replication to the DR site. Live Recovery to VMware and Hyper-V servers is now enhanced where you can configure the virtual hardware specification of the target host like socket and core counts, memory, hard disk provision type, and network adapter while performing the permanent recovery. By default, application-aware processing is enabled for highly transactional applications like Exchange, SQL, Active Directory and SharePoint running inside VMs on Hyper-V server. v4.0 provides log truncation and application-aware processing with inbuilt parity check, and you have the option to select VMs that need them. This report will give you an insight into Quick VM recovery job details like the RTO, start time & end time, the name of the VM that was triggered for recovery, the target server etc., covering the job’s status. With the new set of APIs, generate report on storage utilization with details like the size of VM before the backup schedule, the actual size of the backup data in the storage repository, compression , storage reduction rate, etc. You can install Vembu BDR virtual or physical. The system should have minimum 8 GB of RAM, 16GB is the recommended size. Windows and Linux installation is possible. The Installation is very easy. You will be asked where you want to install the product and you can customize the communication ports if needed. My lab is vSphere only so I only could show the connect of VMware vSphere. 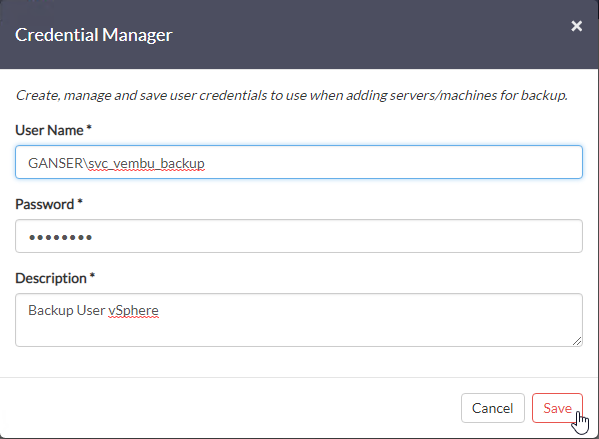 After adding vCenter Server you can click on Backup to add VMs to backup jobs. With enabling Application Aware Processing Vembu BDR will quiescing the application with Microsoft VSS. The default schedule is every hour. This will create an initial full backup and after that incremental backups every hour. Last step is naming the job. You can select immediately start after creation. The wizard will switch to the job list. After finishing you will see the past jobs in the dashboard. To restore a VM go to Recovery and search for your desired backup and click on Restore. For this example I’ve choosen Quick VM Recovery. I only want to validate backup is working. Select Hypervisor, vCenter, Target Host and Datacenter. You can choose a different name. Review your setting and start the restore. The wizard switches to the recovery list. Vembu has evolved their product. The Web-based UI is very fast and very clean. A new user with no experience with Vembu BDR will find all necessary points directly. The installation and the first completed VM backup is done in less than an hour.